Generally, I try to keep my glitter and bling to a minimum, but once the holiday season begins, those rules go out the window. 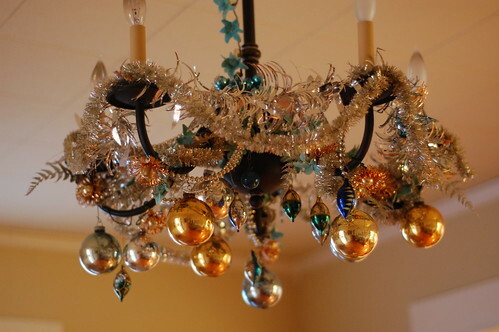 This time of year I do enjoy adding a little extra sparkle to everything, and I just got done trimming our dining room chandelier. I am a total holiday nerd and if it was socially acceptable (and not a fire hazard) to keep a Christmas tree up year round, I would probably do it. I added one more show to the holiday roster... 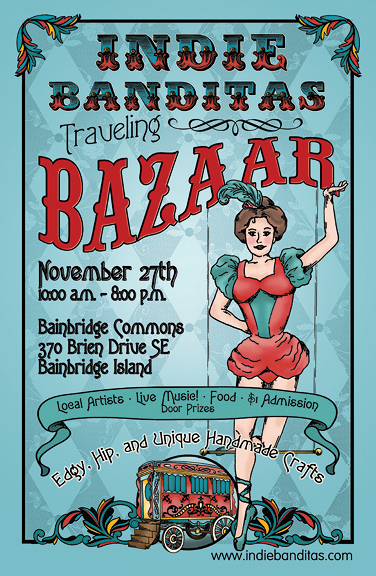 The Indie Banditas Traveling Bazaar on Bainbridge Isalnd! It looks like it's going to be a great one - the vendor list is outstanding. Pop on by if you can! It's this Sunday, November 27th. Details on the poster below, or pay a visit to their website to learn more. Thanks for an Awesome Weekend, Tacoma! This was a full weekend! I started off Saturday sitting on a panel moderated by Katy Evans (of Post Defiance) along with artist Chandler O'Leary and writer (and Metro Parks Commissioner) Erik Hanberg. The panel was part of the Tacoma Art Symposium and we discussed how artists can use social media tools to promote their work. It was an interesting discussion and the audience had lots of great questions. As soon as the panel wrapped up, I dashed over to Kings Books for day one of the Artist Craft Fair. It was an awesome day. Traffic was steady, and I think it was a successful day for all of the participants. Thank you Tacoma for being so supportive of your local artists! Day two wasn't quite as bustling as day one, but still a very good day. There were lots of new folks at the sale this year, like Libertine Tacoma, and Matthew Porter. We saw many of our regulars too. I love seeing all that's being made in and around Tacoma. It's always inspiring. I enjoy the opportunity to talk with other artists and crafters at sales like this. When you work from home, you can feel a little cut-off from the world. It's nice to spend a couple of days connecting with people and finding out about what everyone is up to. 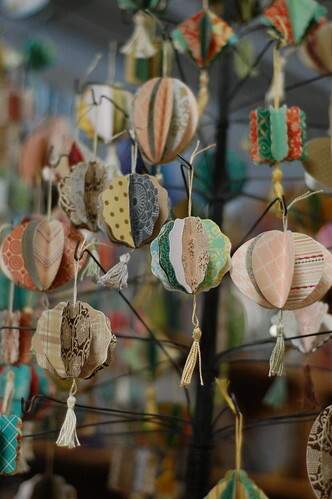 I brought lots of inventory along for the sale including ornaments, pins, birdcages and wreaths. 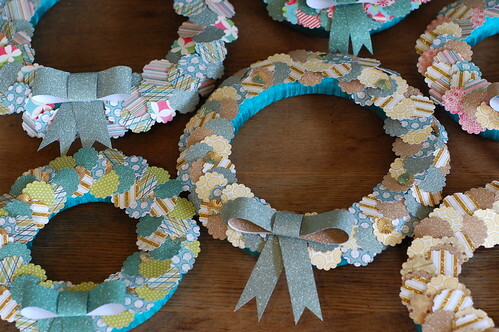 This was my first craft sale with the wreaths and I always feel a tad nervous when I introduce new things. Thankfully, they were well received and I spent Saturday night making several new ones to replace the ones that sold that day. 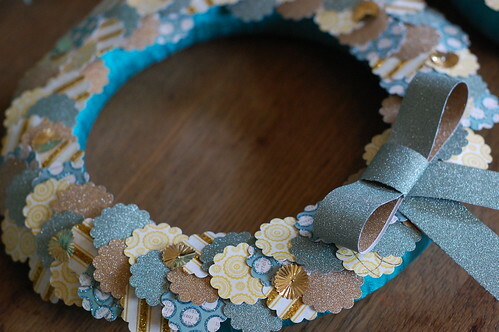 There's lots more making ahead, holiday craft sale season is just getting started! Next up is Glitter Haus this Friday! I hope to see you there!! Please don't forget to RSVP. See You This Weekend? I Hope So! The Tacoma is for Lovers/ Kings Books Artist Craft Fair is happening this weekend! The TIFL sales are always great, but the holiday one is always especially awesome. For more info, please visit HERE! There's a mighty-fine line up of artists on both days - lots of new people too! I'm excited to see what everyone's been making a get a start on my holiday shopping, too. I hope to see you there! I'll be there with bells on. Literally. 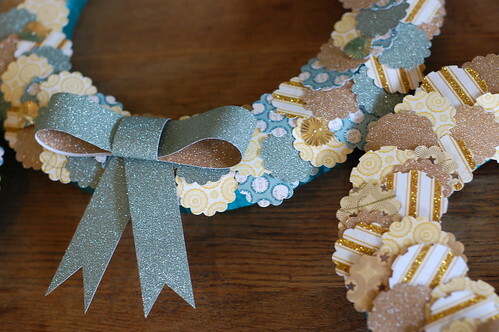 This holiday season I'm introducing some new paper wreaths to my collection. 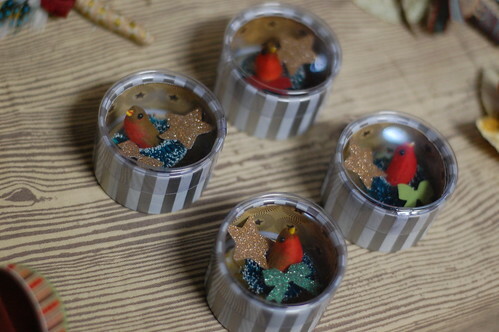 They range in size from six to twelve inches in diameter and they're made with glittered and patterned papers in shades of aqua, gold and green. Custom orders in the colors and size of your choice are available, just send me an email to discuss the details. If you would like to see them in person, please visit me at one of the sales this season. Click HERE to see where I'll be next. Oh, what a week! I came out of retirement to do fresh flowers for an event this week. It's been awhile since I've done any (fresh) floral arranging at all and I had forgotten how exhausting that work can be. The party was huge, and the flowers were plentiful, but I have to say, it went pretty smoothly. No glitches at all, in fact. Just some achey bones today. 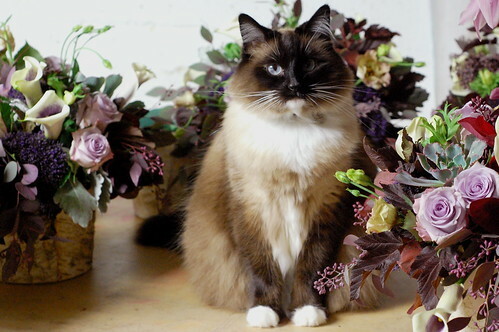 Here's a glimpse at the flower arrangements and my studio assistant, Charlene Butterbean. If you care to see more pictures of the event, you can visit here. After a smooth event, it's tempting to step back into the business. But my heart is in the craft world, and I need to keep pushing that business ahead. So, this week I purged the last of my remaining floral supplies. I took 3 carloads of props, vases, and assorted supplies to Goodwill. I kept the basics - rolls of tape, my knives and clippers - but the rest went away. Soon, we'll begin renovating my former flower space into a sparkling new craft studio. I can hardly wait. Once the room is complete, it will be so much easier to work. My current space is packed full of supplies and inventory - leaving too little space for making. I look forward to being able to sprawl out with all my projects and still have room to photograph, pack, and store my work. FIRST, I have to get through the holiday season. 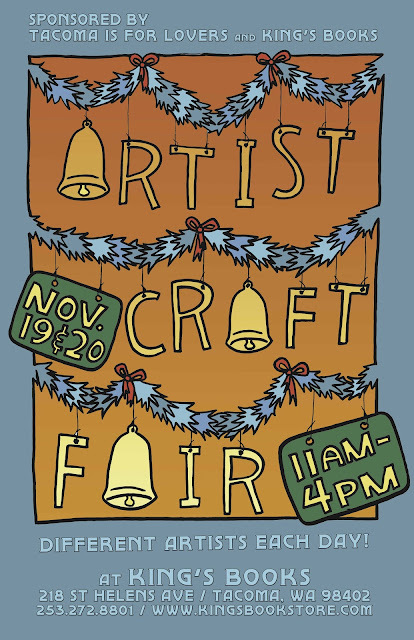 November 19th and 20th I'll be at the Tacoma is for Lovers Artist Craft Fair at Kings Books. 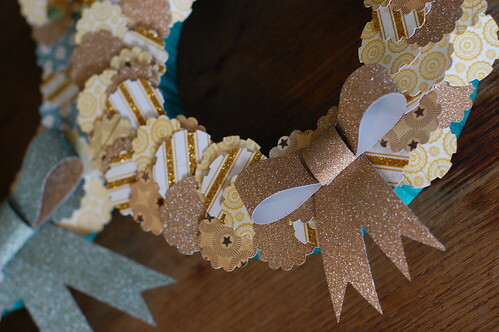 Nov 25th please join me at Glitter Haus - THE holiday craft event of the season! Dec 10th I'll be at the 2nd Saturdayz Market in Seattle. I have to say, It's been a good week. For starters, I'm still floating on air about the whole BHLDN thing. Also, Halle Griffin wrote this nice article and there was a sweet little mention in the The Bride's Guide ( Martha Stewart Weddings blog). As dorky as this sounds, the highlight of the week may have been discovering this fabulous cable knit paper at a local paper store. A good paper just makes me giddy. 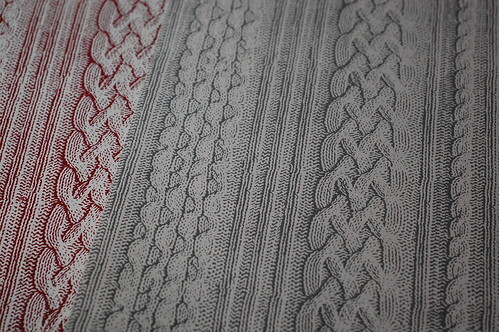 I don't know what I'm going to do with this yet, but I sure do love these cable knit patterns. Sometimes you have to sit with a supply for awhile before you find it's purpose. For now, I think I'll just pin it to my wall until inspiration strikes. 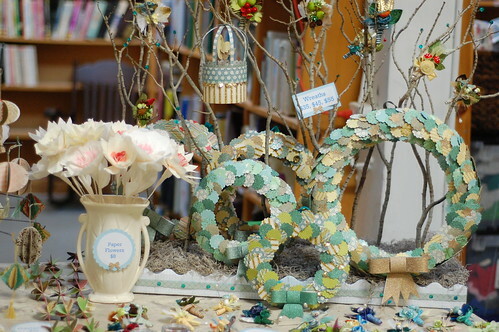 There are lots of art happenings around the Puget Sound this weekend. Today, my friends Sarah (of Deeds and Petunia) and Lori (of Parisienne Girl Designs) are going to be setting up shop at the Bellevue Club Holiday Bazaar. 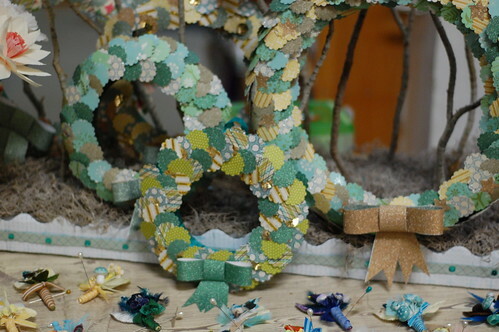 They were kind enough to bring along a few of my holiday pins, paper ornaments and paper wreaths to sell in their booth. If you find yourself on the East Side, please come by the bazaar. 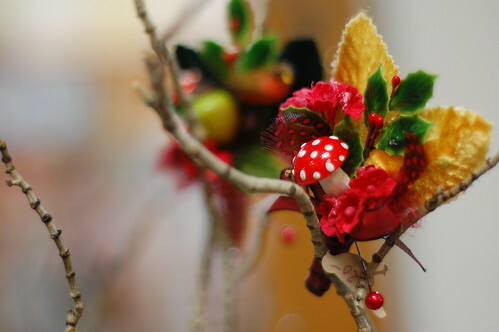 There's an amazing selection of vendors with lots of wonderful holiday goods for sale. The sale runs from 9 to 3 PM today. For more details, please visit their website. For all you Tacomans, it's Art at Work month and there are Studio Tours this weekend. It's always interesting to get a peek inside an artist's world and see what they're making and what items of inspiration they surround themselves with in their studio. I plan to hit a few myself, starting with my friend and neighbor, Chandler, of Anagram Press. I've been working with my crafty friends Lori (from Parisienne Girl Designs) and Sarah (of Deeds & Petunia) on a very exciting event. We've hand-selected a few of our favorite vendors that have great taste and vintage style and we're bringing them together for one festive evening on Friday, November 25th. Cocktails and hors d'oeuvres will be served and our guests will have the opportunity to mingle and shop a collection of handmade holiday gifts and decor items from our vendors. We would love to have you join us! Please visit the Glitter Haus website to learn more about the event, and if you would like to attend our handmade holiday affair, please be sure to RSVP by emailing HERE. 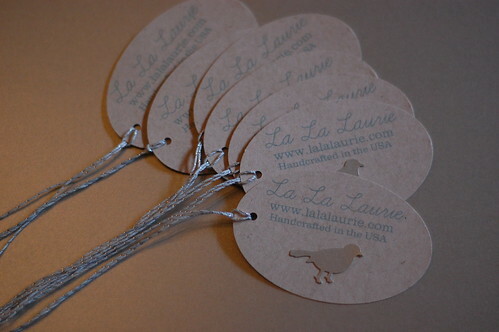 La La Laurie at BHLDN ! For quite some time I've been keeping a little secret under my hat, and now I can officially share it with you. The past couple of months I've been working like mad creating bouquets and boutonnieres that are now available at BHLDN!!! I love their dreamy wedding world and I was so honored when they asked me if I would be interested in working with them. For those of you not familiar with BHLDN, they are an off-shoot of Anthropologie. It's your one-stop, bohemian, vintage-inspired wedding shop. If you haven't seen their website before, I encourage you to pay it a visit and get lost in it for awhile. It's pretty fabulous. 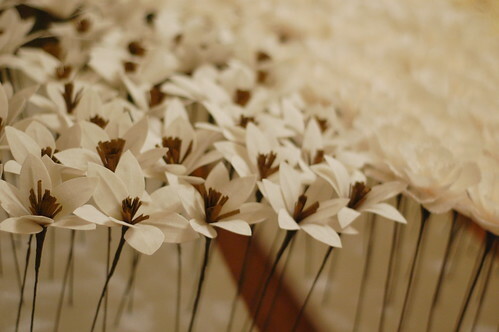 To fill their order, I had to make masses of paper and fabric flowers. I started off in my craft room cutting piles of petals, but soon the project started spilling out into the dining room, guest bedroom, and eventually the kitchen. 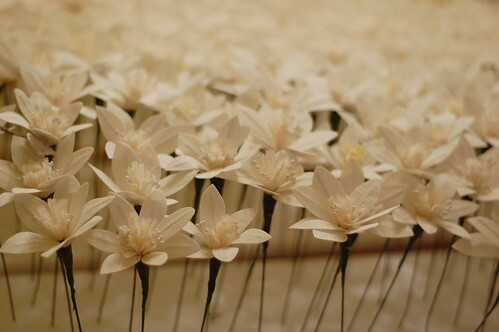 We were living in a field of faux flowers. 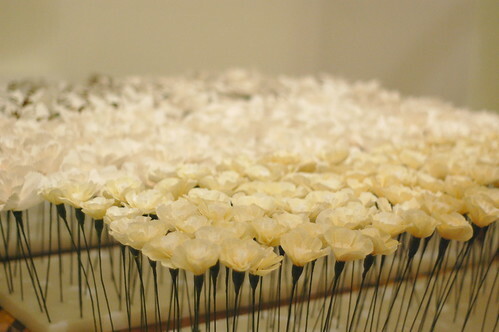 I assembled the flowers one style at a time, and as I completed each bloom, I stuck the stem into a styrofoam board to keep them vertical and safe. Our dining room table looked like a parade float. After all the elements were made, I picked my blooms from the boards, and the bouquets were assembled. 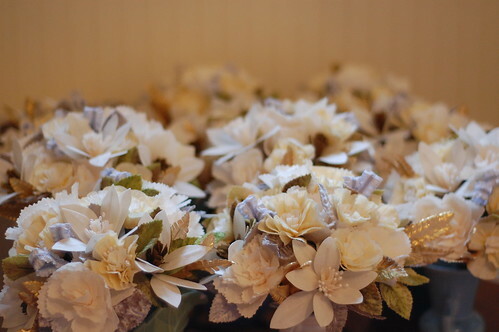 The bouquets were based on a sample piece I made for an issue Seattle Metropolitan Bride and Groom Magazine, so if it looks familiar, you probably saw it in the magazine, or in this post. 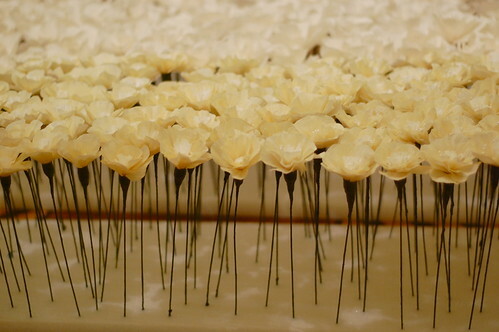 Once the bouquets were completed, the boutonnieres were made, then packaged. 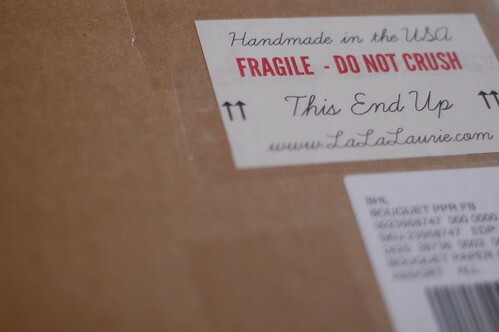 Finally, everything was tagged, boxed-up and sent off to BHLDN. And today, their winter collection has gone live. 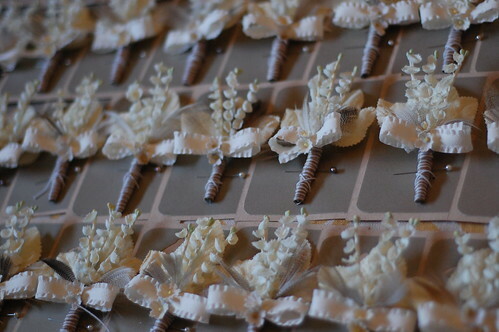 I am so excited to have my bouquets and boutonnieres right up there with the many lovely pieces in their collection. It's a thrill, to say the least.